In the 1970s taxidermy was floundering because of ecological awareness. Taxidermy posts, workshops, and displays were shut down” (Milgrom). With modern social movements such as PETA and the Body World exhibit, people began to question whether taxidermy was humane or not. Melissa Milgrom descirbes in her book Still Life: Adventures in Taxidermy a time when “taxidermy was in one of it reviled phases, the height of the antifur campaigns of People for the Ethical Treatment of Animals and the Lynx Educational Trust for animal Welfare. Advertisements showed beautiful women with flayed dogs draped around their shoulders. People paint-bombed fur coats”. For many, it became impossible to differentiate between taxidermy and animal abuse, while or others taxidermy is the greatest love possible for animals. 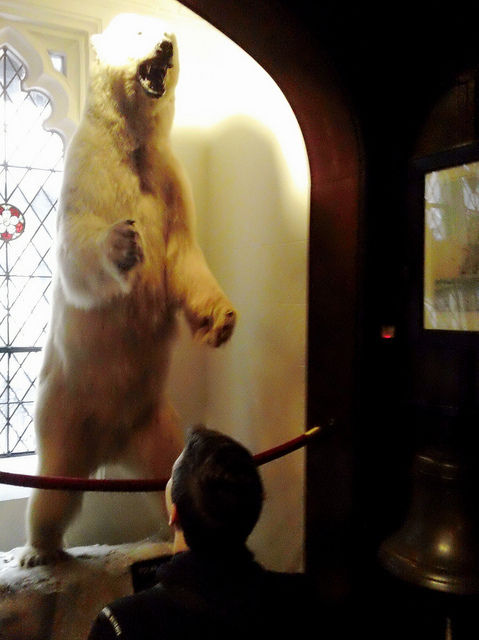 One example of such outcry is over the issue of taxidermied polar bears. “Just as canaries were once used to detect toxic gases in coal mines, the changing lives of polar bears now serve as an early warning of global climate change” (New Scientist). Because of this important and unfortunate role that polat bears are playing in modern culture, many people feel guilty about their situation. For this reason, polar bear displays are dying out.”Many museums, eager to snag the ‘iCarly’ demographic, are ditching their taxidermy collections in favor of Imax movies and robotic beasties. A lot of dusty, moth-eaten stuffed animals have piled up in a lot of half-forgotten museum closets” (Garner). Specifically, a polar bear, Knut, who died in 2011, sparked a controversy over whether it was proper to have him mounted or not. “When someone dies”, critic Jochen Kolbe argues, “I think that you don’t want him stuffed in a museum. Knut is not only a polar bear for people. He is a friend, a family member” (Slackman). Due to the intense connection that many share with animals, they tend to feel uncomfortable with these permanent displays. In this situation, over 100 protestors publically went to the zoo, and even more joined the Facebook page. This entire case may be argued against, however, with the tradition of human preservation. “One preserved human, Ms. Milgrom writes, is the British economist and philosopher eremy Bentham (1884-1932), whose body is seated in a chair in a glass case at University College London. His head is now a wax reproduction. ‘His real head is taken out only for ceremonial dinners,’ she writes, ‘to satisfy the clause in the economist’s will requiting his presence at such events” (Garner). With human preservation dating back to the ancient Egyptians, people continue to struggle with the idea of the humanity of taxidermy, and thus its popularity fluxeuates. The media has grabbed onto this controversy and poked fun at all aspects of it through newspapers and television. The harsh turmoil over it has (whether intentionally or not) renewed and interest in taxidermy. Due to these events, taxidermists all around the world formed the World Taxidermy Championships – a guild. These people who loved their art saw it floundering and decided that they needed to act in order to save it. Because of this action, taxidermy has regained its position in society. Today, taxidermy is experiencing one of its biggest revivals of all time. Over seven million people visit the National Museum of Natural History each year (a more than $31 million industry). In this way, people still want to see taxidermy and it is still a valid and vital medium for education. Even though it is often thought of as mysterious and unknown, taxidermy is a “thriving subculture” with over 100,000 taxidermists (mostly commercial practitioners). They have magazines, groups, and conventions where they can gather. To the modern game and scientific taxidermist, anatomical accuracy is most important. To accomplish this, taxidermists much be shrewd observers of nature in the wild. Their unofficial motto is “First comes anatomical accuracy, then art” (Garner). In contrast to these taxidermists, however, many are focusing on the art aspect. To them, anatomical accuracy may mean very little. Damien Hurst, for example, is a modern day Walter Potter, creating anthromorphic and artistic interpretations of animals. Since its inception, taxidermy has been the source of major controversy. Due to this, it has made its way through many crests and valleys in popularity. The entire process of when “an animal starts out looking like the animal, gets mangled beyond recognition, and then ends up looking like an animal again” (Milgrom) can be gruesome for some and enchanting for others. This somewhat counter-productive process leaves us with an ever present memorial of a creature. Even though overall public opinion of taxidermy will continue to vary, one thing is certain; those truly faithful to taxidermy will forever keep the tradition alive.